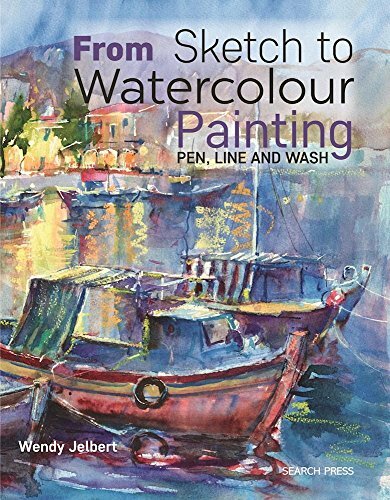 From Sketch to Watercolour Painting by Wendy Jelbert is collection of tips and techniques on sketching with watercolour. The book includes content from the previously published book called Watercolour Tips & Techniques: From Sketch to Painting which I've not seen before. So I'm not sure how much duplicated content there is. There are many tips and techniques shared together with illustrated examples. It's quite insightful and I'm sure beginners can pick up some ideas for practice or further exploration. The only step-by-step instructions are from the three tutorials at the back of the book. Other than that, most text are just brief pointers and tips. For example, when the book talks about how you can draw figures, it only explains why it's good to have figures in your sketch, but the actual process of drawing a figure is really quite brief, and in this case it's just a few paragraph on proportion. In short, this book gives you ideas but if you want to learn the actual techniques to drawing or painting a certain subject, you have to check out other books. This book is insightful but it does not cover techniques in detail. The three step-by-step tutorials are great though. You can follow along by drawing and painting with the instructions. There should have been more of these hands-on exercises which provide more depth to the techniques discussed. The "French Window" pages seem to be very similar, and both drawings on the "Tonal Studies" already existed in the previous book.